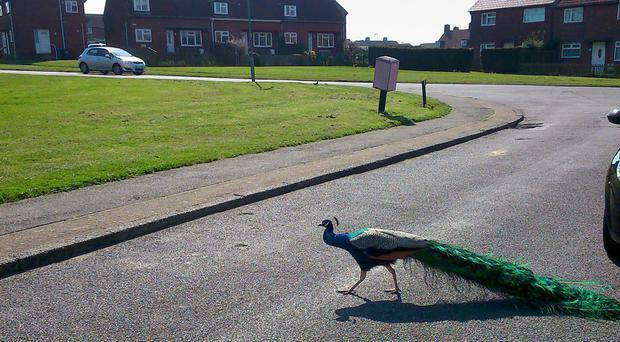 Villagers have spoken out in support of a pride of peacocks accused of ruining village life with their antics. More than 100 people in Ushaw Moor, near Durham, have backed a petition demanding something is done about the noise, mess and damage caused by the birds, which they claim screech at night, foul pavements and attack vehicles after seeing their reflection in the paintwork. But an online poll, publicised on the Deerness Valley Facebook page, has 95% backing for the peacocks to stay, with more than 160 people voting. The former pit village where 4,000 people live is semi-rural and some residents have expressed their admiration for the beautiful birds. Pamela Zanetti wrote on Facebook: "They most certainly should stay, they are stunning creatures so beautiful and make me smile every time I see them." And Jane Moreland added: "I think they are beautiful and I love seeing them, they have been around for years so why are people just complaining now? "Complain about litter, dog mess, unkempt properties first. We are lucky to be able to see these amazing birds." The petition to have the peacocks brought under control was started by Graham Bridge, 55, who said there were up to 30 birds roaming around and disturbing sleep with their mating calls. But Calvin Moore, owner of the Broomhall Farm stables where some people suspect the peacocks roost, said: "I think this has been blown out of all proportion. "There's supposed to be 30 peacocks hanging around street corners, ruining the village like delinquent teenagers? "I think there's about six or seven. "They flew in about 15 or 20 years ago and we accept they are part of rural life." Mr Moore said disabled children ride at his stables and they love to see the peacocks. He stressed he did not own the creatures, adding: "I would hate to see them hurt, for all they are not my birds, I think it would be such a shame. They are stunning, beautiful birds." Mr Bridge was due to have a meeting with an environmental health officer from Durham County Council about the noise on Wednesday.